In Indonesia much tropical forest has been destroyed. In Borneo and Sulawesi large tracts of land have been deforested which has created some disastrous consequences: Large-scale carbon emissions, floods, wildfires, destruction of habitat, food shortages, threats to biodiversity and so on. Masarang has reforestation projects in both Sulawesi and Borneo. With the principles of agroforestry, an ecologically responsible farming system, forest cover is maintained alongside sustainable production of food and other natural resources. This method helps improve the economic, environmental and social value of the forest. New forest is not only created with these principles, protection of existing forest is also ameliorated. The picture above shows the Masarang mountain in 2004, and the picture below shows the situation in 2018. The results of reforestation can be quite spectacular! 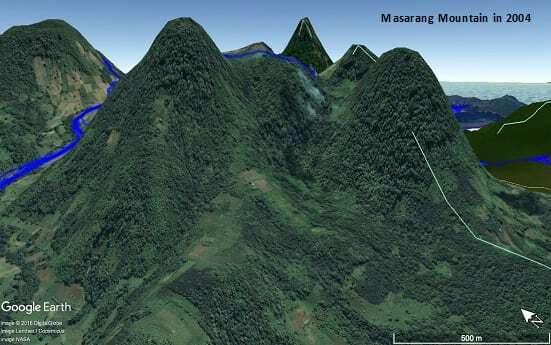 See also Masarang mountain, one of the most successful Masarang projects! A stable water supply in the valleys and a local climate with sufficient rain and lower temperatures. This regulation of water and climate is of great importance to the agricultural yields of neighbouring areas. With reforestation Masarang wishes to protect existing rain forest and create new tropical forest cover. Improved use of the ecological and economic potential of the forest helps create development for and by the local people. This way the local population plays a central role in the protection of the forests they live with. The Masarang mountain delivers drinking water again! In 2012 and 2013 Masarang is providing 40 000 sugar palms along with training for around 1000 farmers from more than a 100 Dayak villages. The farmers learn to tap the sugar palm and are educated about the many uses of the tree. We are also working to help the Dayak people to acquire property rights over the land they have lived in for centuries. This way oil palm companies can no longer easily abuse the ambiguities around customary land rights. Nearly 10 years ago Masarang reforested 80 hectares of degraded valley in Pulisan (North Sulawesi). On the bare grassland surrounding this forest a 1000 new sugar palms have been planted. This reforestation project in the valley in Pulisan houses trees such as the Tjempaka, Pakowa and sugar palm; it has improved the hydrological cycle of this area with as result that Timbukar, a village 10 km away, now has a clean water source. Furthermore, a variety of birds and wild boar is living in the woods. Recently, some farmers observed a few black macaques. Around the forest lay a large area of bare grassland. Masarang ranger Sonny Ering, under the guidance of forestry expert Harry Kaunang, has planted a 1000 sugar palms. We were able to do this thanks to the financial support of our sponsors. In this way Masarang has begun to make the next step in the reforestation surrounding Pulisan. Masarang mountain ridge was logged, burned and eroded for over a hundred years until we bought it in 2001 and completely reforested it. In succession different plant and tree species were planted, and a diverse forest grew here once again. Now the forest is actively maintained and protected by the local population in collaboration with Masarang. Approximately 1 million trees have been planted. The reforestation absorbs approximately 5.000 tons of CO2 per year. A river originating in the mountain range, which had disappeared 50 years ago, now flows continuously again. Seven formerly dried up water sources around the Masarang mountain produce water again and are stable. The sources of Uluna and Tataaren are of great importance for the drinking water supply of the local population. Floods in the village of Matani, which sometimes took place 3 times per year, are a thing of the past because the new forest has greatly improved the hydrological functioning of the soil. Through sustainable forestry and selective harvesting, economically valuable wood has been extracted. The forest provides jobs in local house construction, sustainable forestry, and sugar palm and fruit cultivation. Lower farming lands are fed by springs; because of the now constant water supply about 500 hectares of rice paddies now produce one harvest extra per year which corresponds to an additional quarter of a million kilos of rice for the local populace. Flora and fauna have come back to life. Owls, for example, have made their appearance and the famous Celebes toad and plants that are named after the mountain such as Osmoxylon masarangense and Begonia masarangense have returned. The new forest area is also an educational area for school children. The University of Manado holds regular excursions and their students do research on Masarang mountain. 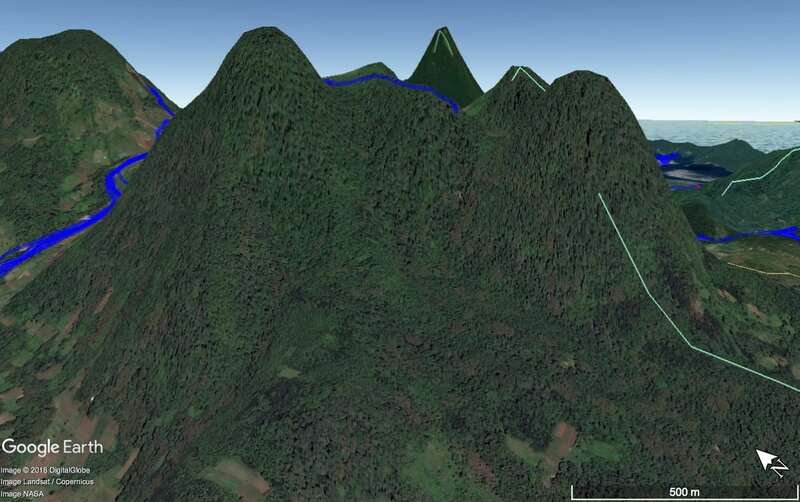 Protection of birds which use the mountain as migratory route. Specifically the large quantities of birds of prey fly over which fly over twice a year. In Sulawesi as well as Borneo Masarang has founded several nurseries and arboreta. Here young trees are cultivated which will later be used in reforestation projects. The planting is done with the help of local schools, church congregations and NGOs. In this way trees such as the Tjempaka, the Pakowa and the sugar palm are cultivated. Jimmy Mantow is one of the employees of Masarang Indonesia which germinates the sugar palm in the nursery. Masarang is a certified supplier of surplus sugar palm trees in Indonesia. In addition to these valuable trees, seedlings of tree species which are on the verge of with extinction are grown in the nursery. Like this, knowledge is acquired on these threatened species and enough seeds are gathered so that the species can be restored into ecosystems and protected into the future. One example is the Kaima, a fruit tree which was close to extinction before Masarang began to cultivate it and plant it in forests. The Palawas, a rare Eugiana species, is another example. Masarang regularly travels to give advice to people and organisations in other regions such as the watershed of Jakarta, the Cirata reforestation project and in Tobolo in North-Maluka. Masarang also works closely with the local Dayak people in West Kalimantan to find solutions for ecologically suitable and productive reforestation. Masarang does research for environmental organisations into how and where reforestation can best be executed. With its experience and expertise in reforestation, Masarang firstly determines which locations suit the different types of reforestation techniques by looking at factors such as soil quality, rainfall, altitude and the contribution to the local economy. Secondly, Masarang examines how reforestation is done most efficiently, which trees should be planted ad in what order. Finally, they help in the implementation of the project and in its monitoring.